“Silly Age” is a sweet nostalgic look at 1958 Havana and a family coping with the pending revolutionary changes within their family and society as a whole. The “silly age” referred to is pre-adolescence and follows the coming-of-age of a precocious 10-year-old named Samuel. 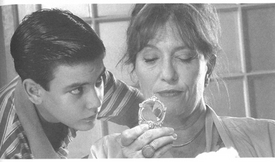 He and his mother are forced to move in with his eccentric grandmother Violeta, who is old, strict and set in her ways. But Violeta, an accomplished photographer, has some surprises to offer, and as her relationship with her grandson gradually develops, family life gets complicated during an emerging revolutionary Cuba. Many films from Cuba highlight the broken family, considering the tragic circumstances that confront Cubans with the 40-year blockade of the socialist island. An enticing life of luxury is projected by the Miami Cubans. “Silly Age” addresses this when Samuel, a young man experiencing many new and exciting things in life, discovers his stepfather plans to leave Cuba with his family when Fidel Castro comes to power. Samuel and his grandmother sense the coming tragedy of loss. The sensitive characterizations and colorful stories told by director Pavel Giroud make this a charming and important film about the early days of the revolution. The authentic sets and fine acting whisk the viewer back to the momentous era of the Cuban Revolution. This documentary is a bittersweet tale of Camila’s memories of the grand pioneering days of the 1970s in Cuba. After her family was driven into exile by the 1973 Pinochet coup in Chile, Camila and her brother took refuge in Cuba. It was there, at a time she calls the “golden age,” where young pioneers embraced the fervor and excitement of a developing social revolution. Bonding with the developing country and the young people she shared her childhood with, Camila regretted the time when she had to move from the island. Now, many years later, she returns to Cuba seeking memories of her friends and activities. Her discoveries are that almost all of her childhood friends who were so filled with revolutionary enthusiasm have left the island. The old buildings, camps and schools are crumbling and most are in disuse. The economic woes forced on the island by the unending U.S. embargo and the untimely demise of the Soviet Union, its major trading partner, are apparent everywhere she travels. She feels the spirit, hopes and dreams of her revolutionary childhood have vanished: Cuba has had to make drastic changes to survive the fall of the Soviet Union, and it has moved far from the ideals of her youth. However, in any country, going back to one’s childhood memories is always fraught with possible disappointments. Friends always grow up and move on, buildings get old, and if there’s no funding, they crumble, often to be replaced by more modern structures. And memories of childhood as a “paradise” are not always the most honest and accurate. To be fair, Cuba is recovering from the near fatal economic blow to the revolution. New structures are being built in place of the old, and the economy has turned around with the assistance of Cuba’s new ally Venezuela. Cuba has struck major new trade agreements with China, Mexico, Bolivia and other new friends. The Cuban people are honestly confronting problems of the revolution and seeking solutions. Although these two nostalgic films paint different pictures of Cuban history, they are both vital and important studies of an amazing chapter in world history, lovingly made by two young filmmakers at a time when any film about Cuba is worth our attention.